As a teenager with complex chronic medical conditions, my age is often a topic of discussion in doctors’ spaces. These one-sided conversations often leave me feeling invalidated, misunderstood and flawed. Though it’s considered uncommon to have chronic, comorbid illnesses at my age, that shouldn’t take away from the fact that I am ill despite that. However, a lot of medical professionals I have dealt with seem to think otherwise. “You’re too young to be dealing with all of this!,” “No one your age should be using a walker,” “I don’t think you’re trying hard enough.” I hear these statements almost every time I’m in a medical space. These thoughtless statements stick to me like glue, as I wonder what someone’s thought process must be like to think saying these things is OK. Recently, one of these statements in particular has been on my mind. “We want to get you back to being a regular teenager.” Hearing this felt like a knife to the gut. Was my transparency all for naught, if my doctor just sees me as opaque? There are so many more complicated layers to the cake that is my life, so why is this being treated as a black and white issue? According to theOxford Dictionary, the term “regular” in this context is synonymous with ordinary, or normal. And this is what I take issue with; I’m not normal. I have serious, incurable, complex health conditions that will stay with me for the rest of my life. There is no way I can ever lead a “normal” life according to the standards set by society. That’s not me giving up, it’s simply fact. I often feel scrutinized for having accepted my situation, as some medical professionals see this as my giving up, or “surrendering” to my lack of health. But what I am doing is practicing optimistic realism. Am I bed-bound and disabled now? Yes. But my health fluctuates, and I may find a better treatment in the future that allows me more independence. I take comfort in that, and focus my attention on one day at a time. I am doing the best I can with what I’ve been given, and that is enough for me. To those of you who are in similar situations, I implore you to speak up when your doctor, or anyone else in your life, says something careless like this. Often, they say these things without thinking about how it will make you feel. It’s important to let them know they are wrong, or that what they’ve said hurts you in any way. By not correcting them, you could be paving the way for further mistreatment. Not only directed at yourself, but at other patients as well. Part of self-advocation is standing up for yourself when someone says something careless. And chances are, they’ll be glad you’ve corrected them. And remember, you are your own biggest advocate. 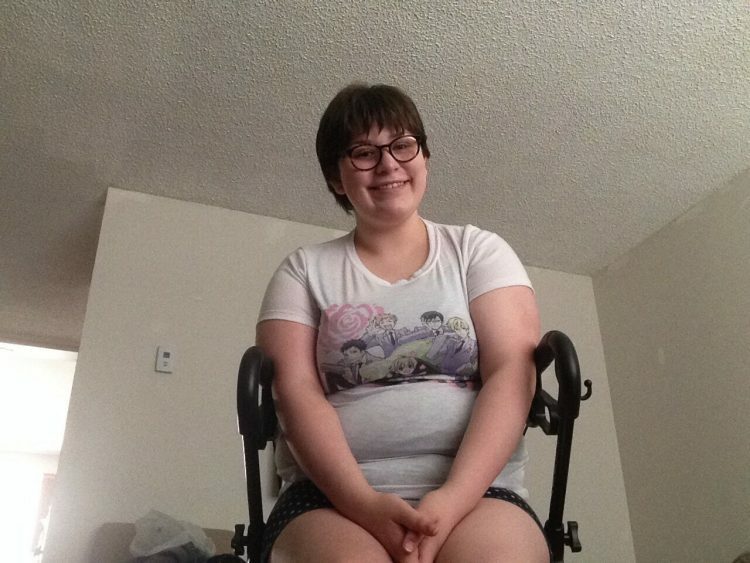 Hannah is a 17 year old disabled artist with complex, co-morbid chronic illnesses. She began writing her own personal blog at the beginning of her journey as a form of expression.